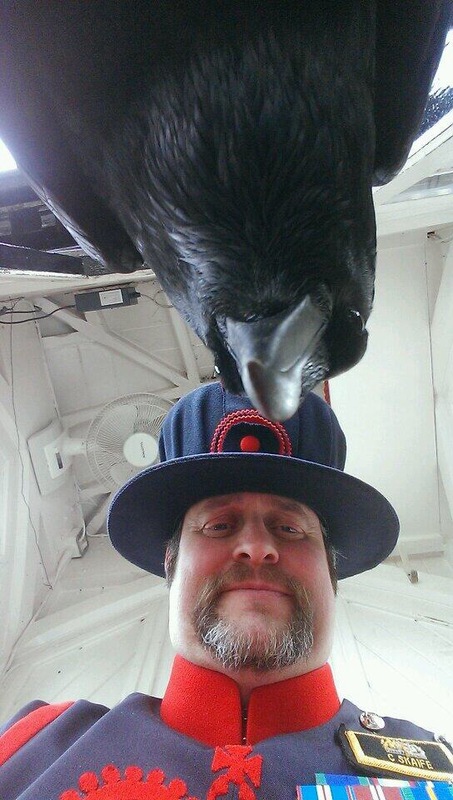 Dear readers of Adventures of Nicky – especially those who miss the ravens – I present to you the Ravenmaster of the Tower of London. He likes ravens as much as we do and is an astute observer of their behaviour. Enjoy the interview! 1/ What is your name and your profession? 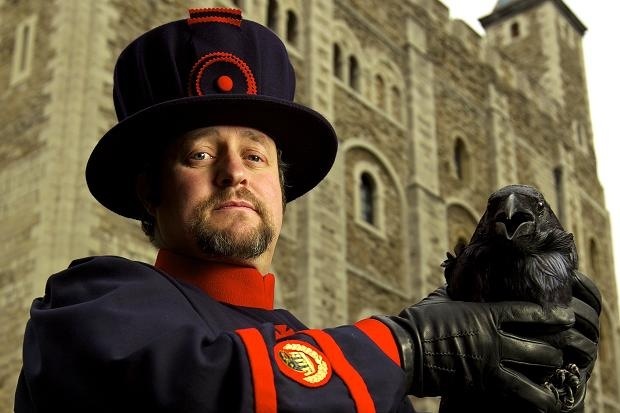 Chris Skaife, Ravenmaster at HM Royal Palace and Fortress, the Tower of London. 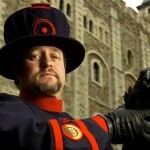 2/ What does a Ravenmaster do? I am responsible for the care and welfare of the Tower of London’s famous ravens. I have a team of four assistants to aid me in my day-to-day duties. 3/ When did you become interested in ravens? I have always been passionate about our wildlife and the environment, so working with the ravens was a must-do for me on having been appointed a Yeoman Warder. They are certainly not everybody’s cup of tea! 4/ How many ravens are in your care, and what are their names and ages? We currently have seven ravens held at the Tower of London, six by a royal decree and one spare. 5/ Are they from a medieval line of Tower ravens? All of the ravens are bred outside the Tower by my breeder for education and display purposes. Only one raven, Munin, was born in the wild, and she is 21! 6/ Why is it important that there be ravens in the Tower? Myth and legend state that if the ravens leave the Tower, it will crumble and great harm befall the country! There are many stories connected to why the ravens became attached to the Tower dating back over 1,000 years. 7/ Are there other birds living in the Tower? We have migratory birds visit on occasion, like ducks, kestrels and geese, to name just a few. 8/ What do the ravens do on a typical day? The ravens are let out of their cages normally at first light – that’s an early start for me and my colleagues! They are territorial, so they go to their corners and guard them vigilantly, normally from each other. They are very playful, so they amuse themselves during the day, finding and hiding food and generally teasing the Tower’s visitors. 9/ Do you train them or is it the other way around? I do train them but only enough to care for their welfare. I don’t teach them tricks! All of our ravens are kept as wild as possible…less one Merlina, who is a bit more friendly. 10/ What do they eat? Ravens are scavengers and will eat almost anything, including small children. Generally they have a diet of meat, including mice, chicks, rats and rabbits, among other stuff. They enjoy stealing food from our visitors and are partial to crispy snacks! 11/ What are their sleeping habits? Ravens are roosters, meaning they sleep during darkness. For me, during the summer, that means early starts and late finishes! 12/ Are the ravens migratory, and do they nest in the Tower? No and no! Not even in the wild – in fact, they are one of the only birds that do not migrate from Alaska during the winter months. They are so clever that they know where to find food at any time of the year. 13/ Do they wear tracking devices? No, I’m always losing them around the Tower, and on the odd occasion they fly off! I do have them colour-banded for identification for our visitors. I can recognize them by size and shape. 14/ What are some of the quirks of your ravens? Merlina plays dead by lying on her back with her legs stuck in the air! Erin has OCD! Well, I mean she has an order of doing things that doesn’t change. 15/ In Nicky and the Lost Templar, the ravens Hugin and Munin have the ability to speak. Can ravens learn to talk like humans? Yes! But I don’t encourage it. We humans have nothing really interesting to say, whereas birds do. So, to that end, it’s easier for me to speak raven! Well that’s what I tell the visiting children. Ravens can mimic lots of sounds. I have one that does a mean (crow’s) caw! 16/ Are ravens and crows the same? No, ravens are bigger and smarter, but they do come from the same Corvidae family. 17/ How can one tell a crow from a raven? Size! Ravens are three times bigger. They also have a larger and thicker beak. 18/ Many cultures around the world depict ravens as messengers, advisers or even shape-shifters. Where does this fascination with ravens come from? 19/ We hear you are writing a book about ravens. Can you tell us more about it? Ha! Yes, of course. But first of all you need to be a child! Children listen, and I’m a story teller. We have been telling stories about ravens since time began. My stories are for children … well, they are for adults to read to their children at bedtime. We have nearly lost the skill of storytelling – everybody sits in front of a screen nowadays, playing games! My stories are for that connection between adult and child – that wonderful time when children listen to every word. Of course they are about ravens!!! But I do need a publisher… Hint, hint! 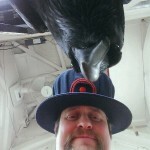 20/ If the Tower ravens could pass a message along to my readers, what would it be? Admire me and photograph me, but keep your distance … I bite!